Why custom paint your bike? Answer- Paint is the single most noticeable change you can make to your bike to personalize it. 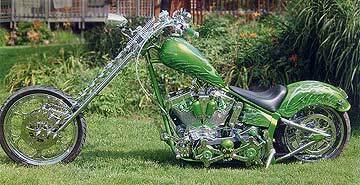 Many people get tired of seeing their bikes blend into all of the other factory painted bikes. People are proud of their bikes. The average motorcycle costs over $10,000. It's not a lighthearted purchase, but rather a very important one. Many people think about their dream bike for years before they actually buy one and in many cases, their bike is a dream come true for them. So why have your dream look like many of the other dreams out there? Your ride should reflect who you are and what makes you different from everyone else. Answer - The cost of a custom paint job varies depending on the kind of bike or car. Larger parts require more time and materials to paint. For painting a single color and either flames or graphics on a motorcycle tank and two fenders, it averages $1700-2200 Murals are priced according to the amount of artwork done. A single pin up girl with an ambiguous background starts at $500 If you have good factory paint, the cost of adding flames, graphics or murals to your stock paint can average $800-1500. Prices for airbrushing flames on cars and trucks start at $1500 but most can average $2000-4500, depending on the size of the vehicle and the amount of flames that are painted on. We try to design the paint job with the customer's budget in mind. We work with you to come up with the best possible paint design and paint job for your budget. Why not spend the money on better wheels or chrome parts? Answer - Because the paint is the most noticeable thing on a bike. You can have two identical motorcycles fresh off the dealer floor. One has custom wheels and lots of chrome parts. The other has stock wheels but has wild custom paint. Which bike will stand out more and be noticed? Which bike better reflects the person riding it? Will my custom paint be durable and last for years? Answer- Yes. Properly done custom paint is far more durable than most people believe. If quality paint materials are used, along with the correctly done preparation and paint processes, custom paint is very, very durable and long lasting. So long lasting in fact, we occasionally get repeat customers years later, who want to change their paint scheme yet their old, In The Weeds Paint still shines and wears like new. And our overall paint process is guaranteed for 5 years against non impact related flaws. Will custom paint devalue your bike? If you are building a custom, we can also help. 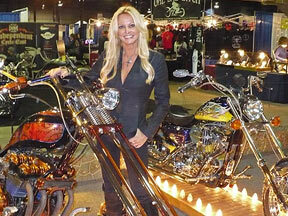 we have helped many customers take home trophies in multiple bike and car shows around the nation. We use nothing but the best tools from SATA Spray Equipment and the best paint from House of Kolor for all our work. But I don't live in the Baltimore / Washington area? How can you still paint my bike or hot rod? Answer We also ship painted sheet metal all over the country, so just because you live in Arizona or some other far away place, does not mean you can't have In The Weeds Paint on your bike. The parts to be painted are removed from the bike and any hardware, like gas caps are removed. The gas tank is aired out and each part is wrapped in several layers of bubble wrap, packed in its own box, and shipped to our shop. The paint colors and designs are worked out by phone calls and/or email. Then we usually do drawings of the artwork and then email back and forth with the customer, fine tuning the design until the customer approves it. Only then is the paintwork done. Once the paint is done, pictures of the completed paint are emailed to the customer. Once those are approved the final clear coat is done and the parts are shipped back to you. If you can not bring your car, bus or rod to us we can arrange traveling to you. You are not limited to the designs you see on these pages. Each job is individually designed with the motorcycle, customer, and the budget, in mind."